First, I think ipython is great. I use it daily and always have an ipython terminal open. But just recently, I was showing off the ipython 0.12 notebook and in the process created a lengthy example while demonstrating the cool features of the ipython notebook. The example included LaTeX equations, plots, etc. Since the notebook session was on something of relevance I decided to clean up the session and use it for the beginning of a report. Here's where things turn bad. Tragically I did not understand the sessions were not automatically saved in any shape or form. I had closed my browser and later return to finish the example ... and nothing! The notebook was empty, it was all gone! It felt like some horrible story older colleagues often recite about early computer problems. Even though my fingers auto keystroke C-s every 5 seconds it didn't help. The frequent keystrokes didn't matter because the keystrokes are mapped to the browsers save function which tries to save a static version of the current session. You have to explicitly click the "save" button at the top of the page. Luckily in my case I had based most of the session off a python script I had earlier written. I only lost the "text" and "equations" I had entered in the ad hoc session. Even so, it never feels good to redo work that has already been done once. With all fairness this was an U.S.E.R error there was a mechanism to save I just didn't notice it. Other than no auto periodic saves/backups and the weird PDF generation (plots always span multiple pages) the ipython notebook is great. Warning to any and all ipython notebook users. Click the "save" button on top of the session!. It has come to my attention that the current development branch of ipython has mapped the C-s to save the session! Also, the autosave is on the feature list. As with most FOSS projects I am lucky that ipython exists and I can use it. With any new tool there is a learning curve (my case with how sessions are saved). 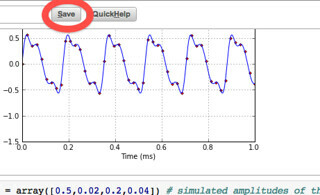 As mentioned the ipython tool is great and I look forward to using the tool and future releases. 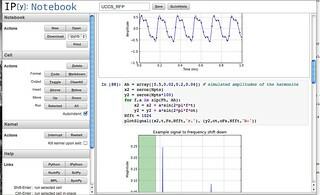 For any new potential users don't hesitate to use ipython notebook you will find much to like about the tool. "Save" only made sense years ago when disk space was expensive. Every application should always auto save and keep an infinite undo (a revision history). @jaidevd Definitely not paranoid. Best of my knowledge this has been fixed in 0.13 (I should check). Also note, I had fun with this post at the expense of ipython. I think ipython is great and the team that develops ipython does a terrific job! Ipython is one of the indispensable tools I use daily. still use the /ipython qtconsole/ most often.